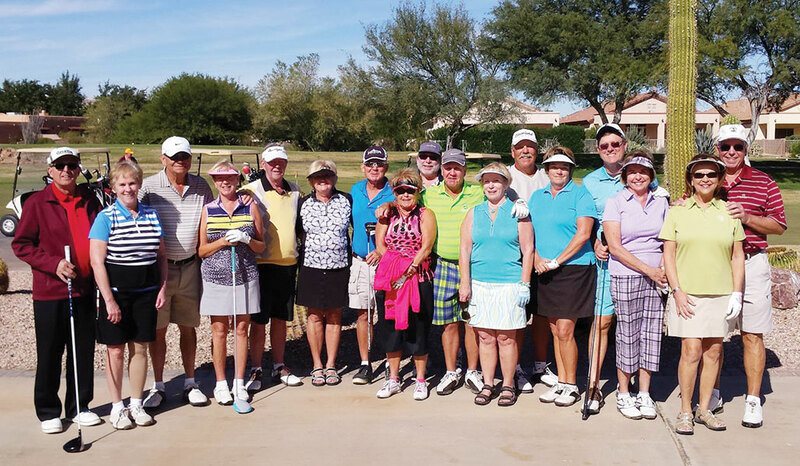 In mid-November, a group of friends from Robson Ranch descended upon Green Valley, southwest of Tucson, for their annual golf trip. We enjoyed three days of golf at the Wyndham Canoa Ranch Resort for the most avid participants. A few of the ladies opted out instead for a shopping day in nearby Tubac. The golfers first played the Canoa Ranch Course, a challenging hilly layout with blind shots, lots of rugged landscape along the fairways to capture errant balls and strategically placed bunkers to keep you honest. The final hole, the 18th, the most challenging was a fairway shot over a large ravine in the blinding sunset. A lot of choice remarks were made on that hole, later to be repeated during our adult beverage time that evening. Some complained, “That course was not designed for seniors!” The second and third days were played on the Torres Blanca Course, a flatter but more enjoyable course (a unanimous vote) near the river basin but with plenty of water hazards/creeks to swallow your ball and trees to avoid. Someone said, “Just hit it straight and in the fairway.” I wish I could. A big thanks goes to Sandy and Roger Horazuk who made the resort reservations (spacious rooms and great accommodations); and Barbara and Tom Gayer who arranged for the three days of golf and interesting fun games on the two courses. Our first evening meal was on site at the Canoa Ranch Restaurant with a wonderful menu and nary a complaint on the great food and service. Our subsequent evening meals were prepared by our teams of cooks and helpers. We all enjoyed a sumptuous Mexican theme meal one night, then a delectable Italian meal the last night. Our evenings were filled with the men watching uninterrupted basketball and football, then later playing poker, and the women playing table games, getting caught up on all their recent family trips and RR past and upcoming events. All enjoyed the fun camaraderie, golf, games, stories and laughter and look forward to the next trip with great anticipation!